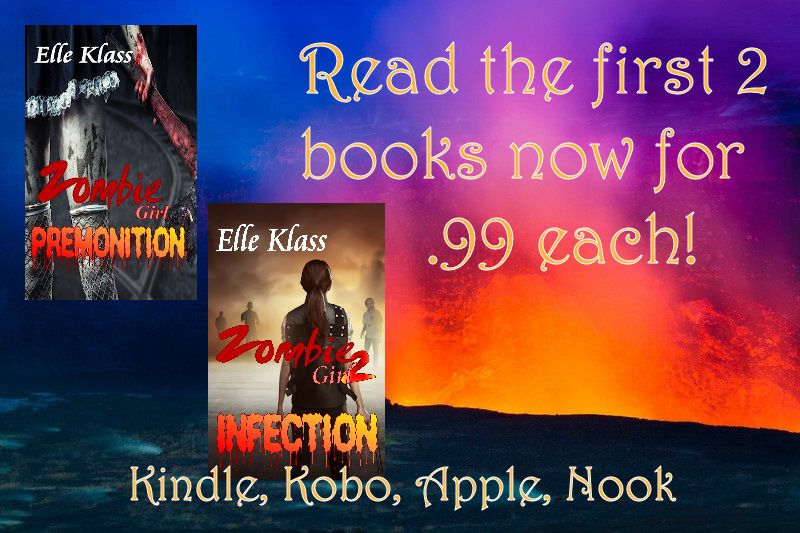 Guest Post from Author Elle Klass! A little over a year ago I released Zombie Girl, a short story in the Once Upon a Zombietale Anthology. You can still buy the anthology and read the original story as well as all the other fabulous zombietales in the book. Readers came to me after reading asking about the story which ends on a bit of a question. I write series so naturally leave a story open for possibilities but hadn’t planned on expanding it. Zombies were something I never really planned on writing about even though I’ve watched Dawn of the Dead, the Resident Evil movies and 28 Days Later series countless times. In fact all the movies are in my collection. I’m not a stranger to zombie horror or the fun movies like Zombieland and Warm Bodies. In my own series, Zombie Girl, I incorporated both horror and silliness. Premonition, the first book just released! Maddie’s parents flip when they find out she’s failing science. That’s her worst problem until she wakes up and finds they’re zombies. Now she must escape them and her house. With nowhere else to go, and the keys to her parents’ sailboat, she makes her getaway. Finding Bryce was a fortunate circumstance and the two take on zombies and set sail for parts unknown. thumped, flew, and slid beneath the car. More zombies hit the car; body parts and blood covered the windshield. I fumbled with the dash, depressing buttons, looking for the wipers. Once I found them and turned them on, they swiped away the blood, leaving streaks on the windshield. Stuck in the pasty, bloodied streaks were little black dots. I looked closer, squinting my eyes. They were lovebugs; horrible little insects rumored to be created in a lab at the University of Florida to control the mosquito population in the state. Twice a year, spring and fall, they marred every vehicle on the road and were a complete nuisance. I was thinking science again! And the thoughts kept coming. The heart pumps blood throughout the body. Did the zombies’ hearts still work? Did I kill them? Slamming on the brakes, I wanted to know. I turned the car around, hitting the side of a truck’s bumper as I did. I drove by slowly. The body parts were still moving, and a couple whole zombies struggled to get to their feet. So how do I kill them? their wriggling bodies and crunching away at their bones. I got back onto I-95 and headed towards the Marina. Infection, the second book releases July 10! Pre-order it now. The .99 price tag won’t last. When Maddie and Bryce touch, she knows her zombie dream wasn’t simply a dream but a premonition. It’s up to her and Bryce to save the world from the doomsday sickness that will kill everyone – in a manner of speaking. They soon learn the zombies aren’t the only horrors that await them in the new fight-or-die world. They battle by each other’s side as the infection spreads globally. Bryce and my father were in trouble. I had to do something, so I grabbed the gun, twisted in my seat, and brought it to my face. I’d never shot a gun other than in video games, but I’d seen tons of movies. It couldn’t be that difficult. I clicked the lever thing on the topside of the gun. I knew that was the safety. “Maddie, your father can handle him” she said, her voice quaking. I imagined her wringing her hands together like a dishrag. From the corner of my eye, I watched Sarah lift her eyes off the cat and stare towards me. I met her gaze and she nodded her approval then mouthed, Be careful. The men drew closer to the boat with each second I wasted. I pushed the door open, snuck around the side and observed my surroundings. I felt like a hunter in the wild carrying the big shotgun, but acted more like a detective on a cheesy cop show. As I moved around the van, I spotted a crate identical to the one where I found Bryce in my… our dream. I scurried towards it, doing my best to step over and around the large puddles so as not to make splashing noises that would catch the creepy bald man’s attention. Upon reaching it, I crouched. Placing my back against the wet wooden side, I slid around it and onto my knees and peeked out. Bryce and my father stepped onto the boat, I used the man’s shining head as a guiding light. He was still behind them. Taking a deep breath, I moved back around the side and out of their view. The nose of the shotgun rose over the top as I held it straight and fired. Its recoil hit my upper thigh and I screamed as I doubled over, the gun hitting the ground. My leg throbbed and I knew I’d have a nasty bruise. Both stories end with a tad of a cliffhanger. 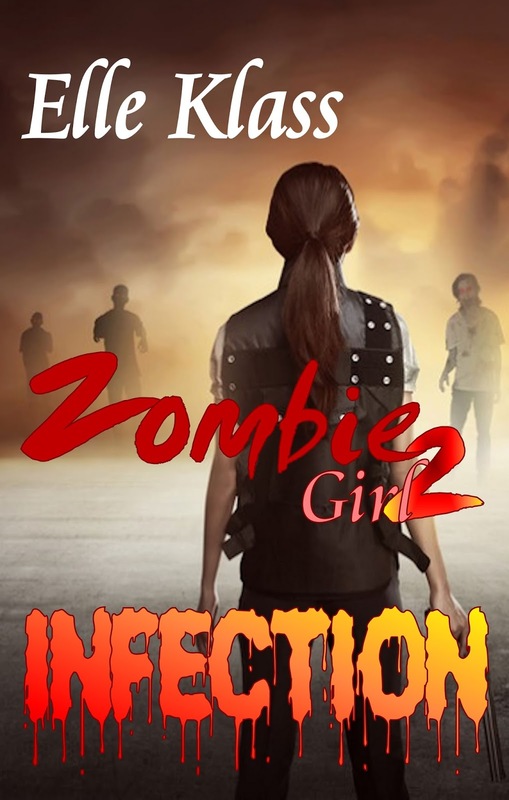 This entry was posted in Blog Tours, Book excerpts, Guest Posts, new releases, Uncategorized and tagged Elle Klass, YA fiction, Young Adult, Zombie Girl: Infection, Zombie Girl: Premonition, zombies by Marcha's Two-Cents Worth. Bookmark the permalink.